Update October 17, 2018: Chrome 70 has now been released to the Stable Channel, and users will start to see full screen interstitials on sites which still use certificates issues by the Legacy Symantec PKI. Initially this change will reach a small percentage of users, and then slowly scale up to 100% over the next several weeks. Site Operators receiving problem reports from users are strongly encouraged to take corrective action by replacing their website certificates as soon as possible. Instructions on how to determine whether your site is affected as well as what corrective action is needed can be found below. We previously announced plans to deprecate Chrome’s trust in the Symantec certificate authority (including Symantec-owned brands like Thawte, VeriSign, Equifax, GeoTrust, and RapidSSL). This post outlines how site operators can determine if they’re affected by this deprecation, and if so, what needs to be done and by when. Failure to replace these certificates will result in site breakage in upcoming versions of major browsers, including Chrome. If your site is using a SSL/TLS certificate from Symantec that was issued before June 1, 2016, it will stop functioning in Chrome 66, which could already be impacting your users. If you are uncertain about whether your site is using such a certificate, you can preview these changes in Chrome Canary to see if your site is affected. If connecting to your site displays a certificate error or a warning in DevTools as shown below, you’ll need to replace your certificate. You can get a new certificate from any trusted CA, including Digicert, which recently acquired Symantec’s CA business. An example of a certificate error that Chrome 66 users might see if you are using a Legacy Symantec SSL/TLS certificate that was issued before June 1, 2016. The DevTools message you will see if you need to replace your certificate before Chrome 66. Chrome 66 has already been released to the Canary and Dev channels, meaning affected sites are already impacting users of these Chrome channels. If affected sites do not replace their certificates by March 15, 2018, Chrome Beta users will begin experiencing the failures as well. You are strongly encouraged to replace your certificate as soon as possible if your site is currently showing an error in Chrome Canary. 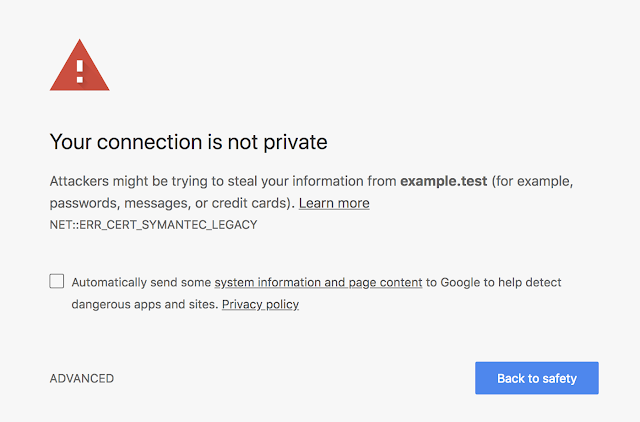 Starting in Chrome 70, all remaining Symantec SSL/TLS certificates will stop working, resulting in a certificate error like the one shown above. To check if your certificate will be affected, visit your site in Chrome today and open up DevTools. You’ll see a message in the console telling you if you need to replace your certificate. The DevTools message you will see if you need to replace your certificate before Chrome 70. If you see this message in DevTools, you’ll want to replace your certificate as soon as possible. If the certificates are not replaced, users will begin seeing certificate errors on your site as early as July 20, 2018. The first Chrome 70 Beta release will be around September 13, 2018. The table below shows the First Canary, First Beta and Stable Release for Chrome 66 and 70. The first impact from a given release will coincide with the First Canary, reaching a steadily widening audience as the release hits Beta and then ultimately Stable. Site operators are strongly encouraged to make the necessary changes to their sites before the First Canary release for Chrome 66 and 70, and no later than the corresponding Beta release dates. For information about the release timeline for a particular version of Chrome, you can also refer to the Chromium Development Calendar which will be updated should release schedules change. In order to address the needs of certain enterprise users, Chrome will also implement an Enterprise Policy that allows disabling the Legacy Symantec PKI distrust starting with Chrome 66. As of January 1, 2019, this policy will no longer be available and the Legacy Symantec PKI will be distrusted for all users. See this Enterprise Help Center article for more information. As noted in the previous announcement, SSL/TLS certificates from the Legacy Symantec PKI issued after December 1, 2017 are no longer trusted. This should not affect most site operators, as it requires entering in to special agreement with DigiCert to obtain such certificates. Accessing a site serving such a certificate will fail and the request will be blocked as of Chrome 65. To avoid such errors, ensure that such certificates are only served to legacy devices and not to browsers such as Chrome.